Breakfast is my favorite meal of the day, as I have expressed probably several times before. I love how the choices are endless. Do you go sweet? Savory? A little bit of both? Health? Full blown 3 course meal? I don't know, but I want it all. Sunday morning we generally make pancakes or waffles with the kids. It's our one breakfast a week that we all sit down together. The rest of the week is filled with toast or cereal. In my case, I turn to homemade granola and yogurt 99% of the time because I know it's healthy and it will keep my full until lunch. Occasionally I am feeling bored with granola, or perhaps a little rebellious, so I will dig around in the freezer to see what goodies are hiding in there. Sometimes it's muffins, or english muffins that I've made. I know it's a really good day when I find bagels in there. Anyone else have things that just get sort of lost in the freezer? I know that I am always packing mine to the brim, so the things on the bottom get lost and forgotten. Out of sight, out of mind is so me. 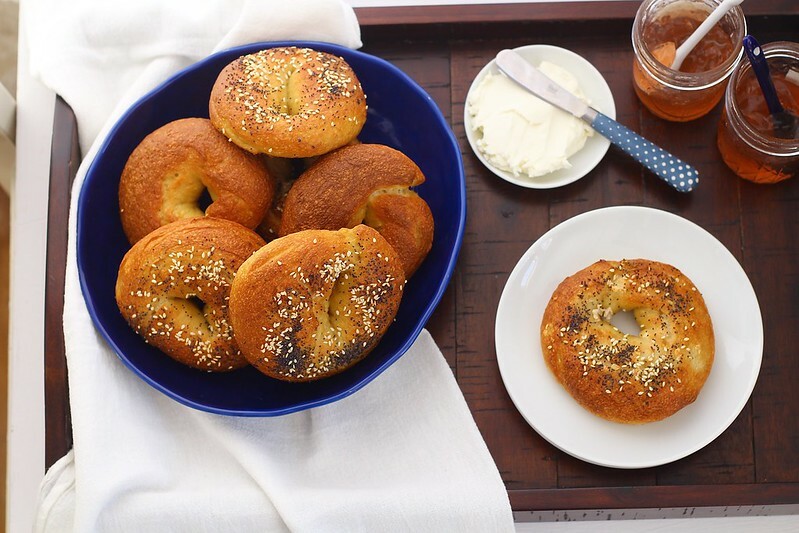 Bagels always excite me when I find them in the freezer because I don't make them as often as I wished I did. They involve a lot of hands on, which I don't mind, but it's finding the time, two days in a row that allows me to make them that is difficult. Lately, things have been so crazy, that two days in a row with free time is completely unheard of. But, a few weeks ago, I was determined to recreate these bagel sandwiches I had a few months back (recipe to come), so homemade bagels were a must. So, I scheduled in the time and made a double batch. I couldn't go through all that effort without having some to freeze! Let me tell you, these bagels are nothing like the basically tasteless bagels you buy from the store. 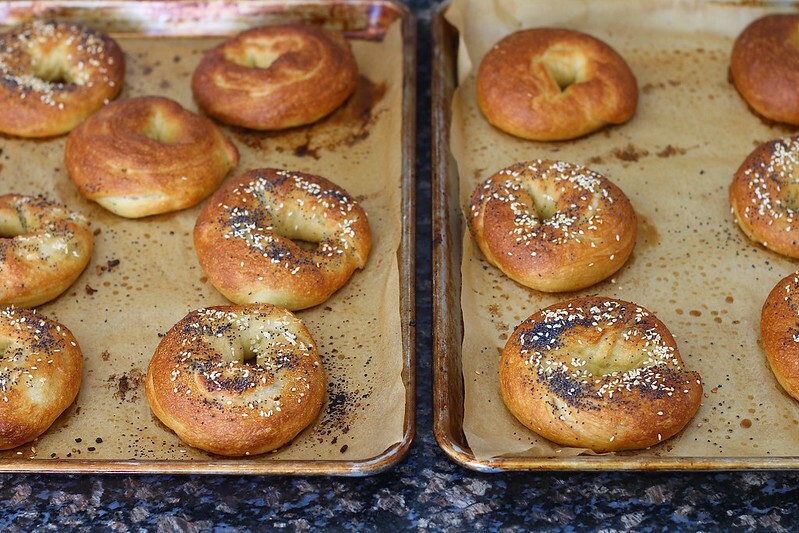 In fact, you don't realize how tasteless those bagels are until you make them yourself. I say it's well worth the time. So, in your near future, take some time out of your week and make these bad boys. You won't regret it. I have added some handy dandy photos to show the steps that are a little more complicated to explain without a visual. Make a double batch, eat them, freeze them and enjoy breakfast again. To make the dough, stir the honey, yeast and salt into the lukewarm water. Place the flour in the bowl of a stand mixer fitted with the dough hook. With the mixer on low speed, pour in the water mixture and mix on low speed for 3 minutes. 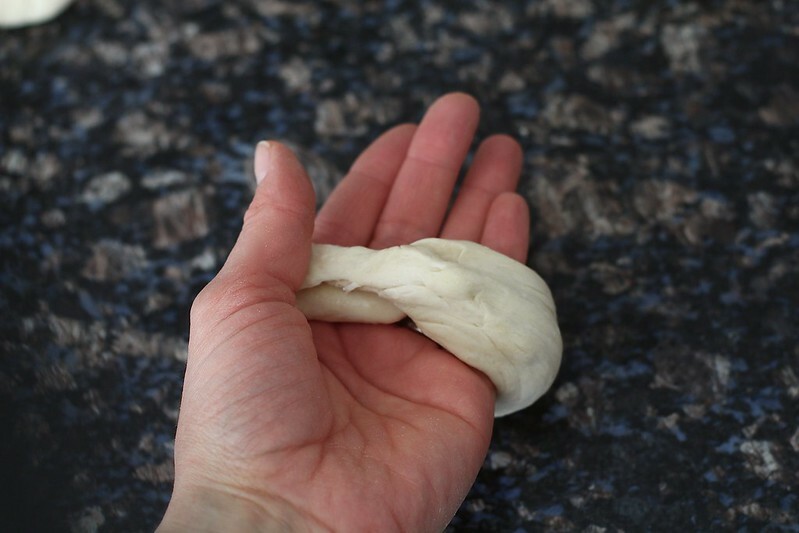 If the dough is a little dry, stir in a little more water until the dough is fully hydrated. Knead on low speed for another 3 minutes. Place the dough in a large greased bowl, turn to coat, cover with plastic wrap. Place in a warm place and let rise for 1 hour. Line two sheet pans with parchment paper or a silicone baking mat, then spray with oil. 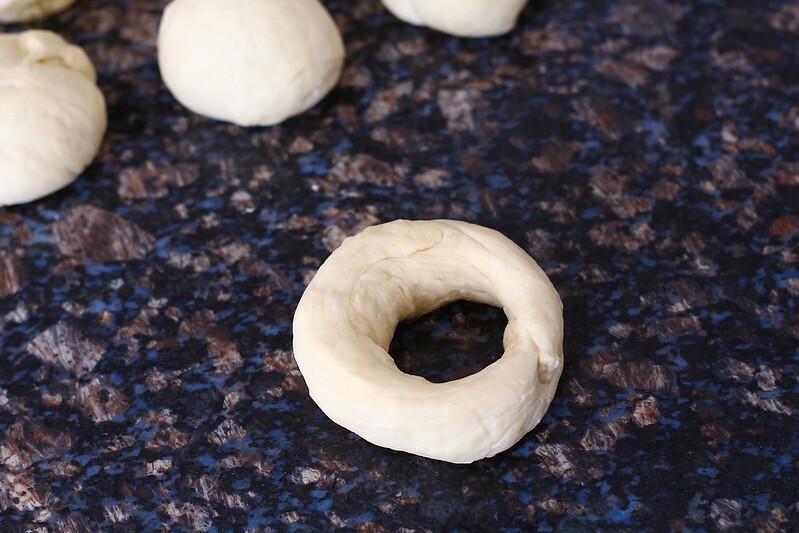 Divide the dough into 6-8 pieces (a typical bagel is 133 grams). Form each piece into a loose ball by rolling on a dry, clean surface. 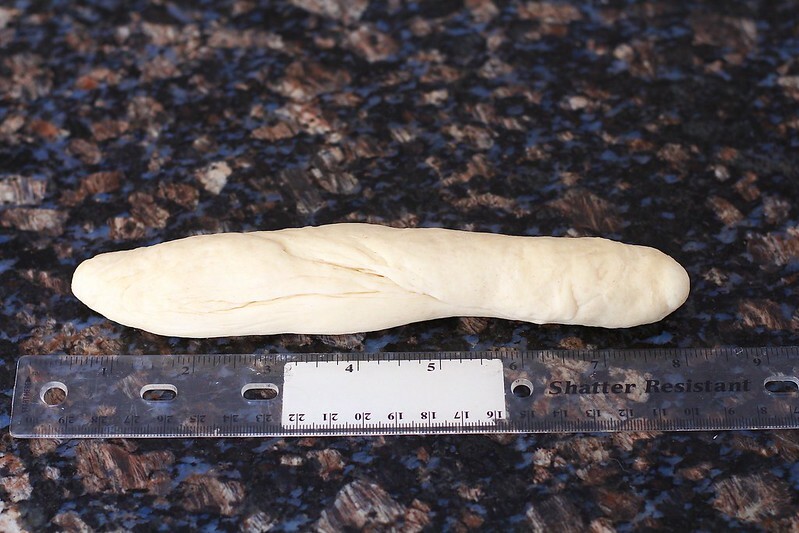 To shape the bagels, roll a ball into a rope about 8 inches long. Moisten the ends and place your hand, palm side up, in the middle of the rope. Pull each end into the center of your palm, overlapping by about 2 inches. Squeeze the overlapping ends together and gently roll the seam on the counter to seal. 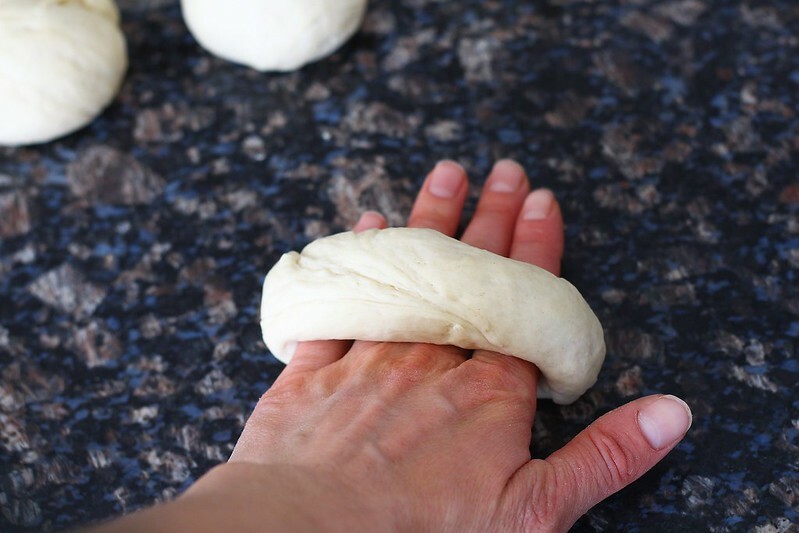 Gently turn and squeeze the circle to even out the thick parts, and creating a hole in the center about 2 inches in diameter. Place on the prepared baking sheet. 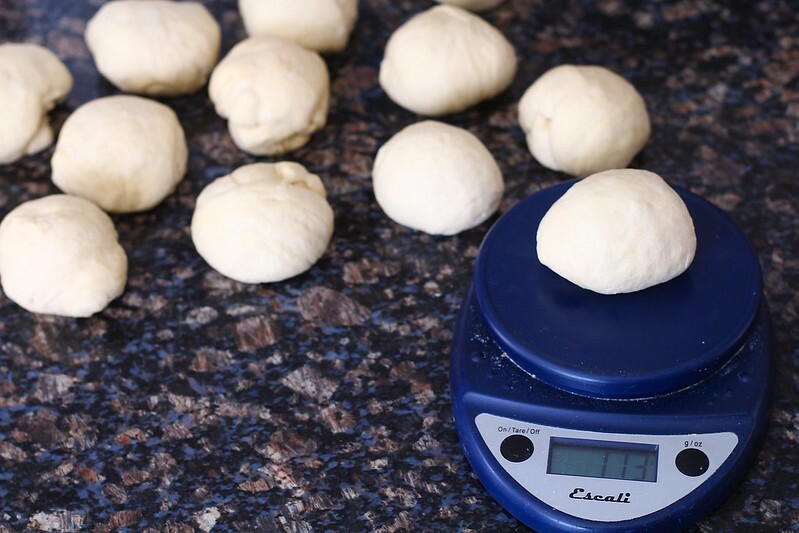 Repeat shaping process with remaining dough balls. 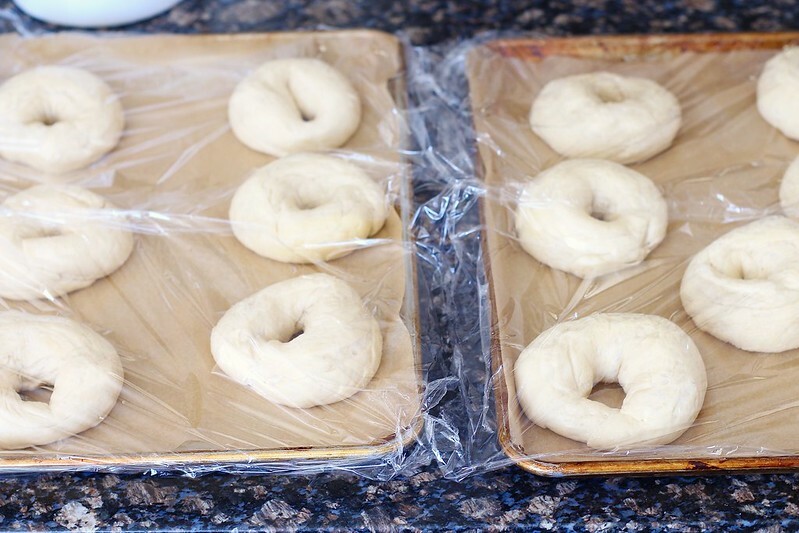 Lightly grease the tops of the bagels, then cover the pan with plastic wrap. Place in the refrigerator and let refrigerate over night. 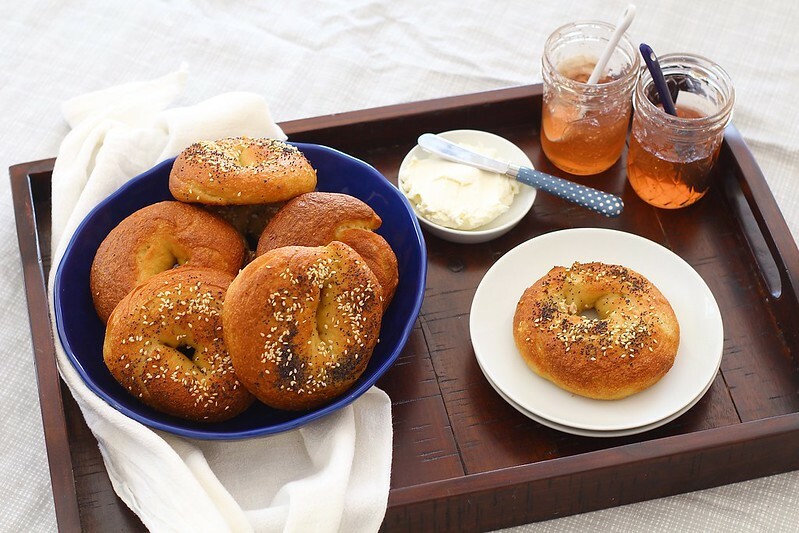 The following day, remove the bagels from the refrigerator 1 hour to 1 hour and 30 minutes before ready to boil and bake. To check to see if the bagels are ready to be boiled after they have sat out of the refrigerator, they need to pass a float test. Fill a small bowl with cold water. Place one bagel in the bowl. If it floats immediately, all the bagels are ready to be boiled. If it doesn't float, place it back on the pan and test again after 15-20 minutes. Preheat the oven to 500ºF. Fill a large, wide pot with 2-3 quarts of water, making sure the water level is at least 4 inches deep. Cover the pot and bring to a boil, then lower the heat to maintain a simmer. Stir in the baking soda and salt. Gently place 3-4 bagels into the simmering water, making sure not to overcrowd them. Boil for 1 minute, then turn the bagels over. Boil for another 30-60 seconds. Place the bagels back on the parchment paper, domed side up. Repeat with remaining bagels. 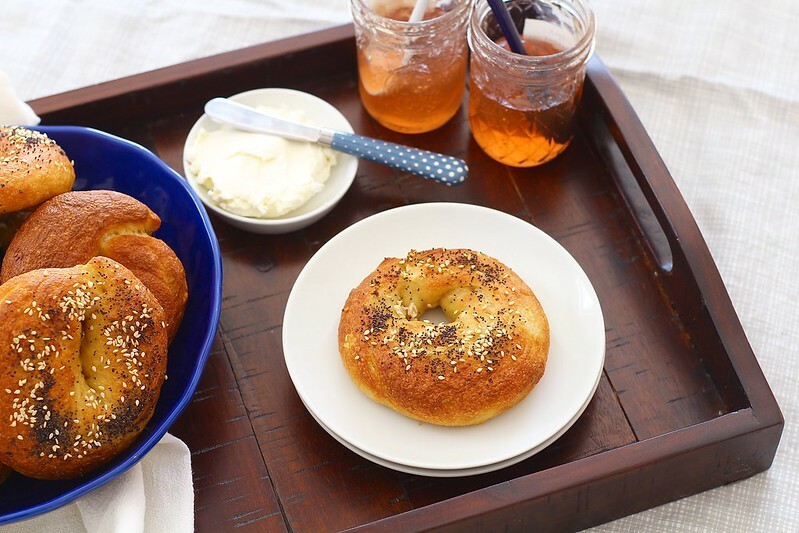 Sprinkle the tops of the bagels with desired, suggested toppings. 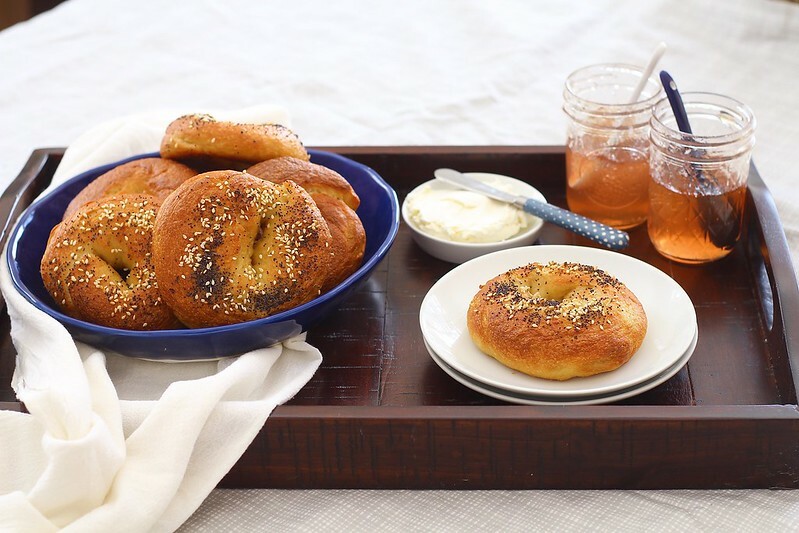 Transfer the boiled bagels to the oven and reduce the temperature to 450ºF. Bake for 8 minutes, rotate pan(s) and bake for another 8-12 minutes, until golden brown. Let cool on a wire rack for at least 30 minutes before slicing or freezing. *To rehydrate your dried onions, soak in water enough to cover for at least 1 hour, draining right before using.